Let's face it, wearing contact lenses can be a very uncomfortable experience. Think of a contact lens as a little piece of plastic that you are putting into your eye. The higher your prescription, or if you have astigmatism, the thicker that piece of plastic is going to be. It's amazing you can even stand wearing it for a few hours! Contact lenses have come a long way in to improve their safety and comfort since first being introduced mainstream in the 1970's. With that being said, today's contact lenses can still provide major health risks (see THIS post) and cause significant dryness, pain, and comfort issues. Here's a break down on how to get the BEST contact lens experience. All contact lenses are going to lose their moisturization as the day goes on. Typically, you can expect 12-14 hours of comfortable wearing time with today's soft contact lenses. Some people can get more; some people can get less. It all depends on your body's own chemistry and amount of tear film production. Your work environment can also play a role. On the computer all day? Your contact lenses are going to be a lot dryer that the average person's, because we blink about 50% less during computer use. Not everyone can sleep in contact lenses, and if you wake up with dry, uncomfortable eyes, discontinuing "extended wear" or overnight wear is the first change you need to make. Think of sleeping in lenses as a special ability that only some, super moisturized eyes can take. And remember, your brand of contact lens may not be approved to handle overnight wear without major medical risks. 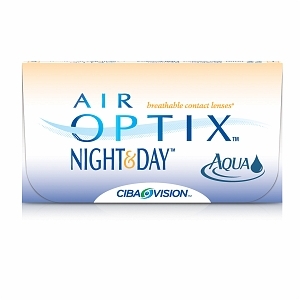 Only Air Optix Night and Day has the moisturization and oxygen transmission to the eye that meets FDA standards for a month of continual overnight wear. If you don't wear this lens, then you need to be taking your lenses out at night, at least a few nights a week. All contact lenses have an expiration date that is determined after rigorous FDA studies that investigate safety and corneal health factors. Your cornea is a delicate tissue with NONE of it's own blood vessels. It gets all of its oxygen from the atmosphere. Now you are going to put a piece of plastic over top of it, and slowly suffocate it for the next month. Sounds crazy, right? Wearing contact lenses is a dangerous activity, and should be treated with the utmost responsibility. Your doctor will tell you how long your contact lenses are approved for, but the information is also readily available online. The most popular monthly lenses are Air Optix, Biofinity, and Pure Vision. 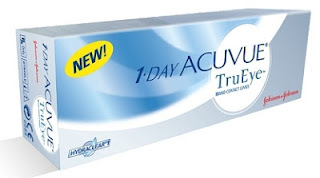 If you wear Acuvue products, then the MOST you can wear your lens is for 2 weeks. Acuvue doesn't make any monthly products. Even if you take them out EVERY night (like you are supposed to if you wear Acuvue lenses), you have to throw them away every 14 days! With a few exceptions, most of today's soft contact lenses are either monthly, bi-weekly, or daily disposal. No surprise here, but if your contact lenses are uncomfortable, then changing to a brand that you throw away more often will increase comfort. A recent study published in Contact Lens Spectrum showed that 2 week disposal lenses (when thrown away every 2 weeks) consistently rated higher on vision quality, comfort, and dryness than monthly contact lenses. Dailies are the ultimate for dryness and comfort issues. If you are having difficulty with your contact lenses, often times changing to a lens that you throw away more often is going to solve the issue. Nothing beats a fresh, new contact lens that you throw away every single day! worn thus far. It is an excellent daily option for people with very intense dryness issues. Yes, solutions DO matter. There's a reason that name brand solutions cost more than generics. Let me reassure you, all contact lens solutions that you can purchase over the counter are approved for killing bacteria and pathogens. The difference comes in the amount of preservatives and moisturizers. Today's best contact lens solutions kill pathogens with less preservatives (these are toxic to your eyes!) and added moisturizers. Try Opti-Free Pure Moist and Biotrue for great options. 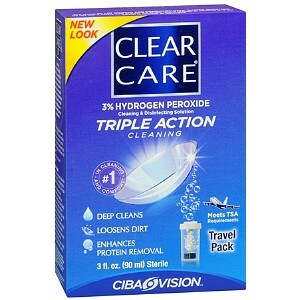 If your contact lenses are still feeling uncomfortable towards the end of the month, try using a hydrogen peroxide solution for an extra intensive clean. Clearcare solution will solve almost everyone's end of the month comfort issues, but you can use it every single night too for ultimate contact lens 'freshness'. Just remember, you have to let the solution sit in the special case for at least 6 hours before you get any solution in your eyes! !